If you have ever written a report, you are probably familiar with the process of preparing your figures in some software, say R, and then copy-pasting into your text editor, say MS Word. While very popular, this process is both tedious, and plain painful if your data has changed and you need to update the report. Wouldn’t it be nice if you could produce figures and numbers from within the text of the report, and everything else would be automated? It turns out it is possible. There are actually several systems in R that allow this. We start with a brief review. Sweave: LaTeX is a markup language that compiles to Tex programs that compile, in turn, to documents (typically PS or PDFs). If you never heard of it, it may be because you were born the the MS Windows+MS Word era. You should know, however, that LaTeX was there much earlier, when computers were mainframes with text-only graphic devices. You should also know that LaTeX is still very popular (in some communities) due to its very rich markup syntax, and beautiful output. Sweave (Leisch 2002) is a compiler for LaTeX that allows you do insert R commands in the LaTeX source file, and get the result as part of the outputted PDF. It’s name suggests just that: it allows to weave S25 output into the document, thus, Sweave. knitr: Markdown is a text editing syntax that, unlike LaTeX, is aimed to be human-readable, but also compilable by a machine. If you ever tried to read HTML or LaTeX source files, you may understand why human-readability is a desirable property. There are many markdown compilers. One of the most popular is Pandoc, written by the Berkeley philosopher(!) Jon MacFarlane. The availability of Pandoc gave Yihui Xie, a name to remember, the idea that it is time for Sweave to evolve. Yihui thus wrote knitr (Xie 2015), which allows to write human readable text in Rmarkdown, a superset of markdown, compile it with R and the compile it with Pandoc. Because Pandoc can compile to PDF, but also to HTML, and DOCX, among others, this means that you can write in Rmarkdown, and get output in almost all text formats out there. bookdown: Bookdown (Xie 2016) is an evolution of knitr, also written by Yihui Xie, now working for RStudio. The text you are now reading was actually written in bookdown. It deals with the particular needs of writing large documents, and cross referencing in particular (which is very challenging if you want the text to be human readable). Shiny: Shiny is essentially a framework for quick web-development. It includes (i) an abstraction layer that specifies the layout of a web-site which is our report, (ii) the command to start a web server to deliver the site. For more on Shiny see Chang et al. (2017). To run knitr you will need to install the package. It is also recommended that you use it within RStudio (version>0.96), where you can easily create a new .Rmd file. Because knitr builds upon Pandoc markdown, here is a simple example of markdown text, to be used in a .Rmd file, which can be created using the File-> New File -> R Markdown menu of RStudio. Underscores or asterisks for _italics1_ and *italics2* return italics1 and italics2. Double underscores or asterisks for __bold1__ and **bold2** return bold1 and bold2. Subscripts are enclosed in tildes, like~this~ (likethis), and superscripts are enclosed in carets like^this^ (likethis). For links use [text](link), like [my site](www.john-ros.com). An image is the same as a link, starting with an exclamation, like this ! [image caption](image path). For more on markdown see https://bookdown.org/yihui/bookdown/markdown-syntax.html. Rmarkdown, is an extension of markdown due to RStudio, that allows to incorporate R expressions in the text, that will be evaluated at the time of compilation, and the output automatically inserted in the outputted text. The output can be a .PDF, .DOCX, .HTML or others, thanks to the power of Pandoc. The start of a code chunk is indicated by three backticks and the end of a code chunk is indicated by three backticks. Here is an example. The evaluated expression is added in a chunk of highlighted text, before the R output. The output is prefixed with ##. The eval= argument is not required, since it is set to eval=TRUE by default. It does demonstrate how to set the options of the code chunk. eval=FALSE: to return code only, without output. echo=FALSE: to return output, without code. cache=: to save results so that future compilations are faster. 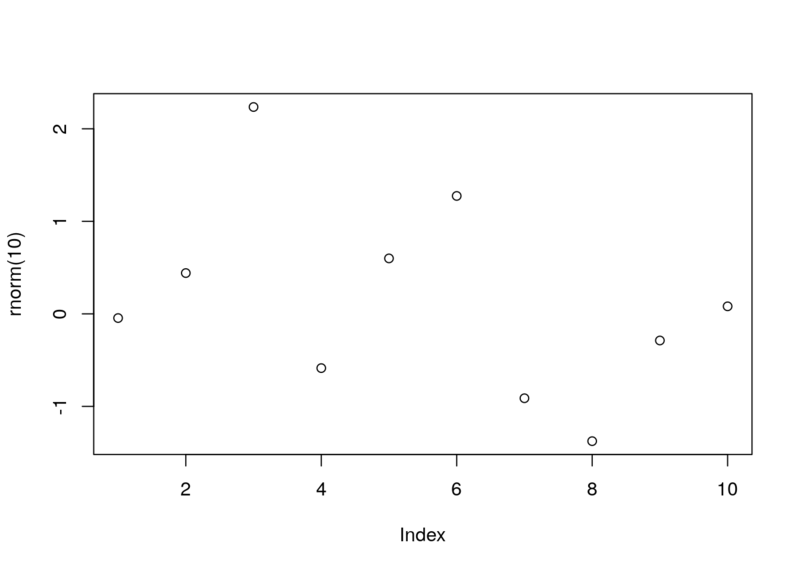 results='hide': to plot figures, without text output. collapse=TRUE: if you want the whole output after the whole code, and not interleaved. warning=FALSE: to supress watning. The same for message=FALSE, and error=FALSE. 0.3378953 is a random Gaussian. BibTex is both a file format and a compiler. The bibtex compiler links documents to a reference database stored in the .bib file format. Bibtex is typically associated with Tex and LaTex typesetting, but it also operates within the markdown pipeline. Just store your references in a .bib file, add a bibliography: yourFile.bib in the YML preamble of your Rmarkdown file, and call your references from the Rmarkdown text using @referencekey. Rmarkdow will take care of creating the bibliography, and linking to it from the text. Once you have your .Rmd file written in RMarkdown, knitr will take care of the compilation for you. You can call the knitr::knitr function directly from some .R file, or more conveniently, use the RStudio (0.96) Knit button above the text editing window. The location of the output file will be presented in the console. As previously stated, bookdown is an extension of knitr intended for documents more complicated than simple reports– such as books. Just like knitr, the writing is done in RMarkdown. Being an extension of knitr, bookdown does allow some markdowns that are not supported by other compilers. In particular, it has a more powerful cross referencing system. Shiny (Chang et al. 2017) is different than the previous systems, because it sets up an interactive web-site, and not a static file. The power of Shiny is that the layout of the web-site, and the settings of the web-server, is made with several simple R commands, with no need for web-programming. Once you have your app up and running, you can setup your own Shiny server on the web, or publish it via Shinyapps.io. The freemium versions of the service can deal with a small amount of traffic. If you expect a lot of traffic, you will probably need the paid versions. To setup your first Shiny app, you will need the shiny package. You will probably want RStudio, which facilitates the process. Once installed, you can run an example app to get the feel of it. Remember to press the Stop button in RStudio to stop the web-server, and get back to RStudio. Every Shiny app has two main building blocks. A user interface, specified via the ui.R file in the app’s directory. A server side, specified via the server.R file, in the app’s directory. You can run the app via the RunApp button in the RStudio interface, of by calling the app’s directory with the shinyApp or runApp functions– the former designed for single-app projects, and the latter, for multiple app projects. shiny::runApp("my_app") # my_app is the app's directory. The site’s layout, is specified in the ui.R file using one of the layout functions. For instance, the function sidebarLayout, as the name suggest, will create a sidebar. More layouts are detailed in the layout guide. The active elements in the UI, that control your report, are known as widgets. Each widget will have a unique inputId so that it’s values can be sent from the UI to the server. More about widgets, in the widget gallery. The inputId on the UI are mapped to input arguments on the server side. The value of the mytext inputId can be queried by the server using input$mytext. These are called reactive values. The way the server “listens” to the UI, is governed by a set of functions that must wrap the input object. These are the observe, reactive, and reactive* class of functions. With observe the server will get triggered when any of the reactive values change. With observeEvent the server will only be triggered by specified reactive values. Using observe is easier, and observeEvent is more prudent programming. A reactive function is a function that gets triggered when a reactive element changes. It is defined on the server side, and reside within an observe function. We now analyze the 1_Hello app using these ideas. Here is the ui.R file. ShinyUI is a (deprecated) wrapper for the UI. fluidPage ensures that the proportions of the elements adapt to the window side, thus, are fluid. The building blocks of the layout are a title, and the body. The title is governed by titlePanel, and the body is governed by sidebarLayout. The sidebarLayout includes the sidebarPanel to control the sidebar, and the mainPanel for the main panel. sliderInput calls a widget with a slider. Its inputId is bins, which is later used by the server within the renderPlot reactive function. plotOutput specifies that the content of the mainPanel is a plot (textOutput for text). This expectation is satisfied on the server side with the renderPlot function (renderText). shinyServer is a (deprecated) wrapper function for the server. The server runs a function with an input and an output. The elements of input are the inputIds from the UI. The elements of the output will be called by the UI using their outputId. Here is another example, taken from the RStudio Shiny examples. br(), # add a break in the HTML page. As the name suggests, radioButtons is a widget that produces radio buttons, above the sliderInput widget. Note the different inputIds. Different widgets are separated in sidebarPanel by commas. br() produces extra vertical spacing (break). tabsetPanel produces tabs in the main output panel. tabPanel governs the content of each panel. Notice the use of various output functions (plotOutput,verbatimTextOutput, tableOutput) with corresponding outputIds. In server.R we see the usual function(input,output). The reactive function tells the server the trigger the function whenever input changes. The output object is constructed outside the reactive function. See how the elements of output correspond to the outputIds in the UI. Now that we have seen the basics, we may consider extensions to the basic report. checkboxGroupInput A group of check boxes. checkboxInput A single check box. dateInput A calendar to aid date selection. dateRangeInput A pair of calendars for selecting a date range. fileInput A file upload control wizard. helpText Help text that can be added to an input form. numericInput A field to enter numbers. radioButtons A set of radio buttons. selectInput A box with choices to select from. textInput A field to enter text. renderImage images (saved as a link to a source file). renderTable data frame, matrix, other table like structures. renderUI a Shiny tag object or HTML. The working directory of the app is the location of server.R. The code before shinyServer is run only once. The code inside `shinyServer is run whenever a reactive is triggered, and may thus slow things. To keep learning, see the RStudio’s tutorial, and the Biblipgraphic notes herein. A template for Shiny to give it s modern look. If you want to quickly write an interactive dashboard, which is simple enough to be a static HTML file and does not need an HTML server, then Shiny may be an overkill. With flexdashboard you can write your dashboard a single .Rmd file, which will generate an interactive dashboard as a static HTML file. See [http://rmarkdown.rstudio.com/flexdashboard/] for more info. For RMarkdown see here. For everything on knitr see Yihui’s blog, or the book Xie (2015). For a bookdown manual, see Xie (2016). For a Shiny manual, see Chang et al. (2017), the RStudio tutorial, or Zev Ross’s excellent guide. Video tutorials are available here. Generate a report using knitr with your name as title, and a scatter plot of two random variables in the body. Save it as PDF, DOCX, and HTML. Leisch, Friedrich. 2002. “Sweave: Dynamic Generation of Statistical Reports Using Literate Data Analysis.” In Compstat, 575–80. Springer. Xie, Yihui. 2016. Bookdown: Authoring Books and Technical Documents with R Markdown. CRC Press.